US Secretary of State Rex Tillerson urged the Gulf Arab nations to ease the blockade of Qatar, citing humanitarian concerns and saying it may hinder the US-led campaign against Islamic State (IS). “We call on the Kingdom of Saudi Arabia, United Arab Emirates, Bahrain and Egypt to ease the blockade against Qatar,” Tillerson told reporters in Washington on Friday, adding that the blockade caused unintended hardship to the people of Qatar and poses an impediment to the military campaign against IS (formerly ISIS/ISIL) in Syria and Iraq. “The blockade is hindering US military action in the region and the campaign against ISIS,” Tillerson said. “We ask that there be no further escalation by the parties in the region,” Tillerson said, calling for “calm and thoughtful dialogue with clear expectations” in order to resolve the crisis, endorsing the mediation proposal by the Emir of Kuwait. Tillerson noted that Qatar “has a history” of supporting groups that have spanned the range “from activism to violence” and that the emir of the country “must do more, and must do it more quickly” to crack down on terrorism. The current situation in the Gulf is “troubling” to the US, its allies in the region, and the people directly affected, Tillerson said. His announcement, scheduled for noon local time on Friday, was 90 minutes late. Tillerson left without taking questions from reporters. On Monday, a group of nations led by Saudi Arabia cut diplomatic and trade ties with Qatar, accusing it of sponsoring terrorism, being too close to Iran and interfering with domestic policies of other nations. 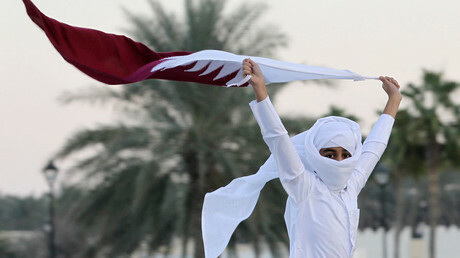 The government in Doha has rejected the accusations. The blockade has included closing all borders, sea lanes and airspace to Qatari traffic, severing diplomatic relations with Doha, and a travel ban between Qatar and the participating states. US Secretary of Defense James Mattis was informed of the Gulf nations’ plans to cut diplomatic ties with Qatar, according to a Pentagon spokeswoman. "The secretary was aware," Assistant to the Secretary of Defense for Public Affairs Dana White said in a briefing on Friday. "He was aware that there was a discussion ties would be cut." Qatar hosts two major facilities used by the US military, an airbase at Al-Udeid, and Camp As-Saliyeh logistics center. The latter, which contains warehouses and equipment sufficient for an entire US Army armored brigade, was essential to the 2003 US invasion of Iraq. Al-Udeid is home to the forward headquarters of the US Special Operations Central Command (SOCCENT) and the US Air Force’s Central Command (AFCENT), with advanced command and control infrastructure built up over the past 14 years, with Qatari funding.